The wedding party and guests are gathered around a dining table covered with china, crystal, and silver; the table is decorated with flowers, a large cut glass fruit bowl, and tulle. Baskets of flowers hang overhead, and swags decorate the walls behind. Title by cataloger. 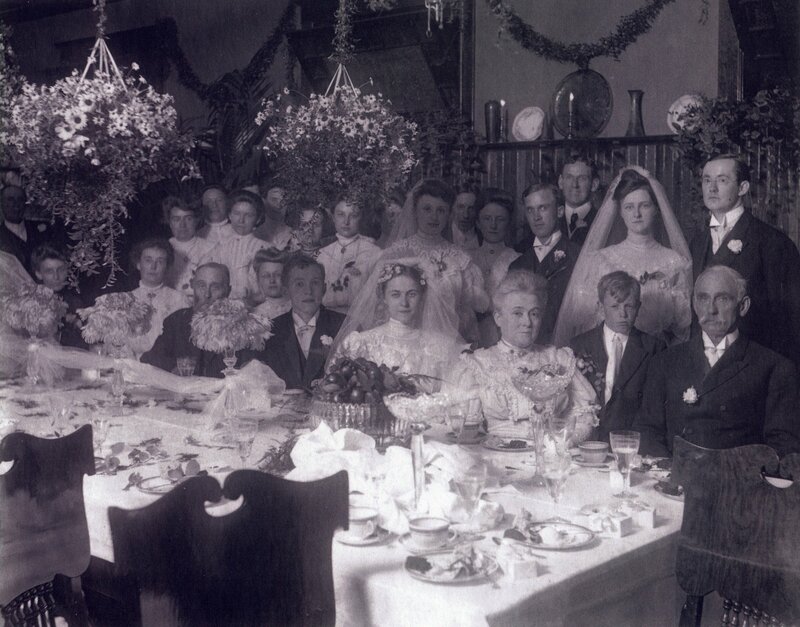 From right to left in the front are; Melvin Clark, Melvin Clark Jr., Emily Clark, the bride Marguerite, the groom Edmund Wurzburg, and the groom's father F. W. Wurzburg. The photograph was taken at the Lake Drive home of the Clarks, formerly Gibson's Restaurant and now Mangiamo's.